Stop the season — United manager David Moyes wants a do-over. Think of all the pain and suffering this magnanimous idea would save. Plus, it would give Wayne Rooney’s head wound time to heal so that he doesn’t have to look so miserable wearing a fanny pack that is constantly slipping from his prodigious dome, much like United’s Premier League crown. I realize that cynics will see my brilliantly radical suggestion as merely self-serving, given that halting matters after five games would finally hand Arsenal a richly deserved league title and its first silverware since Mesut Ozil was making silky passes at his senior prom. But the skeptics are wrong. My proposal is a bold act of kindness in service to any and all remaining United fans who would certainly find it less odious for the perennial fourth-place-is-a-trophy Gooners to make off with the top spot than, say, Manchester City. Or God forbid, Liverpool. Ask any Red his thoughts after Sunday’s debacle, and he’d lift his head from his quiche-stained hands to give you his best Moyes death stare. At least that, more or less, is what owner Jack Keane said to me at the Football Factory, my spiritual soccer home in NYC, after his beloved United had been disemboweled by Man City in the first Manchester derby for Moyes and his managerial counterpart, Manuel Pellegrini. While there is another dour Scot in charge of United, that’s where the comparisons begin and end between Sir Alex and The Anointed Yet Disappointed One. For one thing, Moyes looks a lot more like Willie, the red-headed Scottish groundskeeper in “The Simpsons,” than Sir Alex does, even though they’re equally angry. More important, he appears to possess none of his predecessor’s genius for disguising the cracks in United’s championship edifice. The Old Evertonian basically inherited a squad that ran away and lapped the league last year in what proved to be Fergie’s final season berating referees and pointing at his watch from the Old Trafford sidelines. What was remarkable about that team was not its vast reservoir of talent but rather its nonpareil will to win. How many times last season did United climb off the canvas in a late round, bloody and battered, to overtake their opponent with a fierce combination of mental fortitude and Robin van Persie? 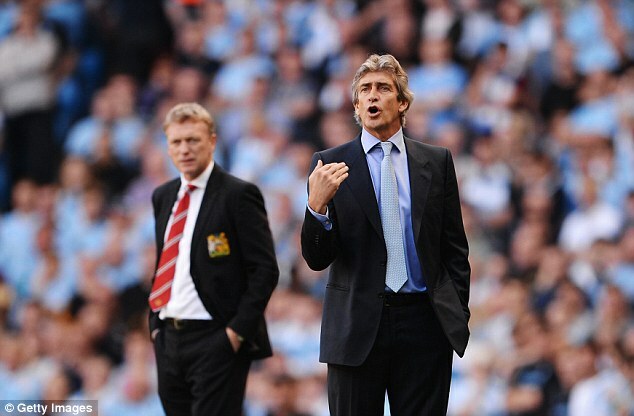 Unfortunately for United, on Sunday at the Etihad, neither was on display and City took merciless advantage. So thoroughly did the Sky Blues outplay, outhustle and outmuscle Moyes’ men that even referee (and perennial 12th man) Howard Webb was unable to help United avoid abject humiliation at the feet of their despised crosstown neighbors. Only City’s generosity of spirit saw them essentially stop playing after 50 minutes, at which point they were already up 4-0. But in many ways, the 4-1 result, thanks to Rooney pulling a goal back with a sumptuous free kick, was more worrisome for United fans than the 6-1 annihilation of two years ago at Old Trafford. At least back then they knew that the man who presided over their squad would ultimately find a way out of the morass and restore them to their rightful perch. With Moyes, there are no such guarantees.